My father always had high hopes for me. From the day I was born, from the day he gave me my name, I was entrusted with tremendous expectations. And Father always tells me, “I’m just trying to give you all of the things my parents could never give to me.” He was Zachary Wentworth, the smiling face on the logo of Wentworth Plushies Inc. And so, I've never felt like my identity was mine to choose. I've always felt that the name that my father chose for me set in stone who I was destined to become: Hunter Wentworth. At age five, Father enlisted the help of Jaf--a foreboding and very grumpy old Lupe--to train me in hand to hand combat. My heart was in archery, but my father stifled my love of archery in favor of continuing my battle training. Jaf would try uselessly to teach me about all manner of blocks, defensive stances and weak points, but to no avail. I just couldn't do it--I couldn't handle the idea of fighting another Neopet. It was just too cruel. But my father was a stern krawk; he had Jaf train me for nine years. Then, on a fateful day in Year 15--just weeks after my fourteenth birthday--my father shuttled me off to to heart of Sakhmet, to the royal palace. It was the fifteenth of The Month of Running. Recruitment day. All Neopets aged fourteen or older were eligible to try out to become trainees for the King's Royal Guard. These esteemed trainees were the most physically able youths in the land, and grew up to become sentries at the palace walls, or to stand guard at the King's dinner table while His Highness entertained guests. There was no position more honorable, and for that reason, my father's deepest desire was that his son would be deemed fit for it. It was a day that changed my life profoundly. Aeliksar knocked excitedly on the door. I was still in the dining room, nibbling at a tchea fruit, my hands trembling with anticipation. But the excitement he felt was entirely different than what I felt. Aeliksar and I had grown up together, close as brothers, and he, too, had been training for this day. The difference was that Aeliksar was in prime physical condition, ready for anything that came his way, and had earned a reputation as a Battledome prodigy. He was the youngest Uni in all of Sakhmetian history reach level 100. There was no doubt in my mind that he would be accepted into the Guard. He'd dreamed of it for years. I, on the other hand, felt nothing but dread. I knew that I was only going to humiliate myself. I barely had the strength to properly wield an Air Sceptre, and Jaf had only successfully built my stamina up to the point where I could do three consecutive push-ups. I'd only ever won once in the Battledome. I already knew what would happen, but Father still insisted on sending me off. I finished off my tchea fruit and threw the stem into a nearby wastebasket. Then I walked to the door to greet Aeliksar. "Are you ready?" he asked, beaming. I sighed. "As ready as I'll ever be." I stepped across the threshold, pulling the door shut behind me, and began to make my way down the steps in front of my NeoHome. Aeliksar and I lived on the same street, situated in the core of Sakhmet, and the palace was walking distance. Though it wasn't yet too warm outside and the sun hadn't quite risen over the horizon, perspiration gathered on my forehead. "I just--I'm scared. I don't know." "Are you sure you really want to try out?" he asked. I laughed wryly. "As if I have a choice. My father wouldn't allow me not to try out. We're already here, anyway." We were nearing the entrance to the palace grounds. Hundreds of other young Neopets were lined up, dressed in their finest workout garb, many of them wielding Battledome equipment that was shipped here from Smuggler's Cove or the Hidden Tower. These kids had, more than likely, been training for this day for years, as I had. I could tell that there were others here who felt as afraid as I did, but there were many more whose eyes had the same self assurance that Aeliksar displayed. Foreboding sentries stood at the front of the line, facing all the recruitment candidates, spears crossed to block the gates the led to the palace. The sun had finally finished its ascent to the crest of the horizon. It was time. A tall, broad-shouldered Grarrl approached the gates. He swung them opened and said something to the sentries that I couldn't hear. The Neopets in line had been chattering anxiously, but once the gates were open, we fell totally silent. The sentries uncrossed their spears. We waited apprehensively. Then the Grarrl cried, "Recruitment Day has begun! Follow me to receive your assignments!" The Grarrl led us to the very same grounds where the trainees practiced six days of the week. We found ourselves lined up in front of seven foreboding members of the Guard. The Grarrl said, "I am Captain Pan. You will be split up into seven groups, and then you will undergo a series of tests in agility, endurance, and critical thinking. Good luck." The Guards split us up alphabetically by last name--that meant Aeliksar and I would be in different groups. "Good luck, Hunter," he said. He was led off by his recruiter, while I nervously made my way toward my group. Our leader introduced herself as Hesa. "Recruits, we will now begin the first test." The sun was setting over the Lost Desert, the sky a vibrant golden color. I'd made it through most of the day without too many blunders, but now came the hardest part: the critical thinking test. Hesa led us to a climbing wall some twenty feet high, footholds built into it and a pit of stakes at the bottom of it. How are we supposed to reach the wall with those stakes around it? I wondered. "Candidates, all trainees must not only possess physical prowess, but also mental agility. For each of you, I will place an item at the top of this wall, and you must find a way to retrieve your item in the shortest amount of time possible. Whoever does so the fastest will be awarded a perfect score for this portion of the test. You may use only one additional item to aid you in this task. Line up in front of me and choose this item now." She stood in front of a line of items: everything from grappling hooks to potions was in that line. When my gaze fell upon the last item in the line, my eyes widened. It was a bow and arrow. When it was my turn to choose, I selected the bow and arrow. There was just one arrow. It was hard to practice archery without my father's knowledge, so I was a little rusty, but if there was just one arrow I'd need to make my shot count. "Who would like to go first?" she asked. My hand shot up. "You?" The other candidates looked at me curiously. They'd seen me struggle through our tasks all day; doubtless they were asking themselves why I, of all Neopets, would volunteer to go first. And yet I found myself volunteering anyway. "Okay," Hesa said. "What is your name?" "Hunter Wentworth," I told her. "Hunter, approach the starting line." She gestured to a white line of chalk in the ground in front of the pit of stakes. She had a loaf of broad in her hand. Deftly, Hesa leaped across the stakes and made her way to the top of the wall; she placed the loaf at the apex, then returned to the ground. "Your time will begin once you move from the line." My eyes were wide with apprehension. I would need to make this shot count. I stepped back from the line and noticed her begin to count my time. I lifted up the bow. It was a bit heavy for my stature, but this was what I had, and I needed to make it work. Maybe I could salvage myself from the embarrassment of the first two tests. I strung my bow and aimed at my minuscule target. With bated breath, I launched. The loaf came toppling down. "Eleven seconds," Hesa announced. 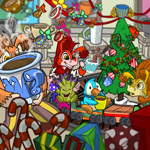 The other Neopets in my group began to murmur in shock. I couldn't believe what I'd done. It was well past dusk when the groups met again in the training yard. Aeliksar and I found each other again in the commotion; everyone chattered about the day, the tasks, and who they thought would be recruited. Captain Pan conferred with the group leaders for what seemed like hours. It was amazing to me that they could decide our fates on the spot like this. After an eternity of waiting, they broke up their huddle. They'd reached a consensus. "Candidates!" cried Captain Pan. We fell silent immediately. "Your leaders will give you your results." The first group leader, a meek looking Kau, stepped forward. "From my group, the following Neopets will be offered positions as trainees in the Royal Guard: Isabella and Aeliksar." I heard Aeliksar inhale sharply beside me. "Congrats," I whispered. "You must've been really good if you were one of the only two to make it." He grinned. My group would be last, so I was left in an awful state of fear for the next few moments. Finally, it was Hesa's turn to step forward. "We have decided to do something unusual this year. For his talent in archery, we have decided to offer the following candidate a position in the Silver Arrows: Hunter Wentworth." My vision went blurry with tears; the Silver Arrows were an elite team of archers that guarded the chambers of the King himself. They were a group shrouded in mystery and renowned for their philosophy of pacifism; they vowed only to use their weapons if the King's life was at stake. Aeliksar and I made our way home a short while later, and I was still delirious with joy over the position I'd been offered. I would finally prove to my father that archery wasn't just a useless pastime. We split up once we reached my house. I ascended the steps to my front door while Aeliksar continued to his own NeoHome. The cook, Draak, opened the front door for me. The scent of roast grackle-stuffed turkey and puntec fruit pasta greeted me. As I crossed the threshold, Draak eyed me suspiciously. This morning, as he served me breakfast, he'd made me promise to tell him if I made it. I decided to leave the news a surprise until I saw Father. He was waiting for me at the dinner table, his hands folded in front of his place setting. "Good evening." His eyes were void of emotion; I couldn't tell what his expectations were. We seated ourselves, and for a few moments we sat in silence. Then I said, "Father, I have some news." A strange look flashed across my father's face. "I've been offered a position as a trainee for the Silver Arrows." For a moment, his face didn't change. I worried that he would lash out angrily. He'd always hated my archery, and I didn't know how well he would take to finding out that I was to make a career of it. Then I saw my father do something he rarely did: he smiled at me. "Hunter, I'm--I'm proud of you." For the first time in my life, I felt that I was good enough for my father. He didn't say anything else to me through the meal--he was a krawk of few words--but in a way, what few words he had said meant the world to me.